Who Will You Deny, Yourself or Christ? Life in the Spirit part 6, "God's Inseparable Love"
Life in the Spirit part 5, "Good Glory!" Life in the Spirit, part 4 "From Groaning to Glory"
Life in the Spirit, part 3 "The Family"
I AM - Never Late! Are You Carrying a Comfortable Cross? Has Jesus Been Born in You? Will We Be Silent or Will We Shine? What Will You Give to Jesus? Should I or Shouldn't I? How Much Do You Love God? Have You Been Baptized by Jesus? Should I Get Baptized Again? Lessons from "Green Eggs and Ham"
How Will We Be Remembered? Who is Going to Clean the Church? I'm Sorry, But It is Not Over! Do You Need A Change? Where Would Jesus Be Born Today? The Holy Spirit is God! Is the Bible Fact or Fiction? Is the Bible Relevant for Today? The Finale, God Has an App for That! Too Blessed to Be Stressed! Hazardous---Are We Living Out God's Grace? 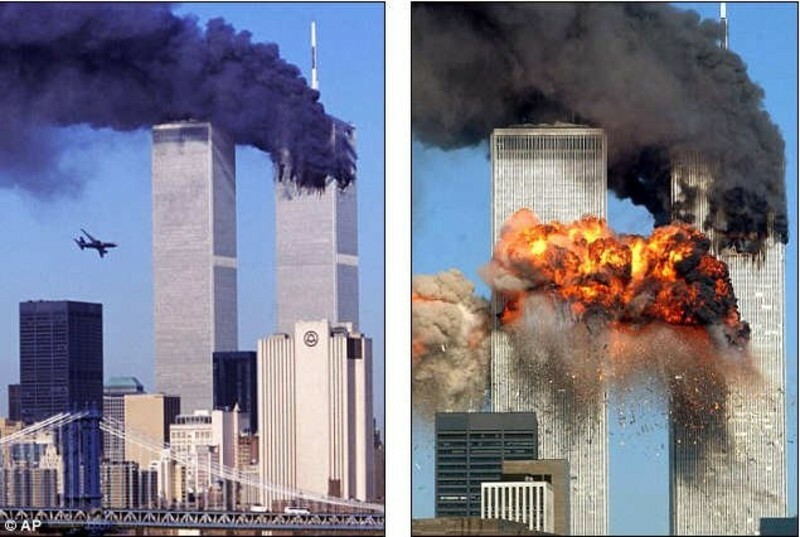 Do you remember what you were doing 15 years ago today when 4 commercial airliners suddenly became weapons of destruction for those who hate our nation and our God, Jesus Christ? I think some people would like to forget that it ever happened, but we must not forget. I’m not saying we should remember the anger and fear we felt, but we must remember those who lost their lives and what we learned from the attack. Much of the nation has forgotten. For a few weeks after the attack, our nation sought God, whom they had been ignoring. People began thinking of others instead of only themselves. Literally, more money was donated than at any time before in the history of the world. People lined up around blocks all over the world to donate blood. Politicians stopped their squabbling and came together in defense of our nation. Other nations joined in our grief. We drew closer as a nation, consoling one another and working together to recover from the devastation. During that time, America was great. Many times after 9/11, 2 Chronicles 7:14 was quoted, but unfortunately, we have not obeyed it. 2 Chronicles 7:14 if my people who are called by my name, will humble themselves and pray and seek my face and turn from their wicked ways, then I will hear from heaven and I will forgive their sin and heal their land. For a time, we did obey. For a time, Congress prayed and worked feverishly as one. For a time, people gave unselfishly. For a time, people started back to church, praying, and seeking God. For a time, kids were allowed to pray in school. For a time, America was united again. For a time! But that’s the problem—TIME. Time makes us forget what happened. There is famous quote, "Those who cannot remember the past are condemned to repeat it." Therefore, we must not forget! But many have forgotten, and America has missed what God would have done in our nation had we continued seeking Him. Over the past 15 years, we have not only slid back to where we were before Sept. 11, 2001, but we have fallen even further from God. In the years that have followed 9/11, our nation has become more divided and more sexually perverted. Crusades have intensified to remove the words “under God” from the Pledge of Allegiance, to stop the Congress of the United States from opening in prayer, and to remove “in God we trust” from our currency. At a time when we need Jesus more than ever, organizations and politicians are doubling their efforts to forget God and remove Him from all public life. There are many examples of this, but one of the most shocking is our President declared that we are not a Christian nation and had Christians symbols covered up at Georgetown Univ. when he spoke so that no one would be offended. No one but Christians, that is! We intentionally forgot God, who made us and this nation! We took God out of the schools and taught our children that this nation is not good, that it was founded by evil means, that it committed mistakes that deserve to be punished. Not only did we not teach our children the truth, we didn’t learn from our mistakes, nor the mistakes of others in the Word of God. 1 Corinthians 10:11-12 Now these things happened to them as an example, but they were written down for our instruction, on whom the end of the ages has come. Therefore let anyone who thinks that he stands take heed lest he fall. Therefore, we are heading back down the same path of destruction that we were on before Sept 11, 2001. Any ground we gained has been swallowed up in a sea of “forgetfulness”. Many want us to forget. They don’t want the videos of 9/11 shown. They don’t want to repent and obey God. So we will reap what we sow. The consequences will continue. God is still trying to speak to us. But, because we fail to listen and obey, we can expect more decline. One indication is the choices we have for President this election. Like them or not, these candidates reflect the character of our nation. We, the people, have chosen them. Therefore, it is likely we will have at least four more years of ungodly leadership from the white house and the court system. (Remember, the President chooses our federal judges.) America will never be great nor recover morally, economically, or securely until it returns to God. Deuteronomy 30:9-10 The LORD your God will make you abundantly prosperous in all the work of your hand, in the fruit of your womb and in the fruit of your cattle and in the fruit of your ground. For the LORD will again take delight in prospering you, as he took delight in your fathers, when you obey the voice of the LORD your God, to keep his commandments and his statutes that are written in this Book of the Law, when you turn to the LORD your God with all your heart and with all your soul. I believe this prophecy still applies to any nation whose God is the LORD, Jesus Christ. Notice what we must do to be blessed: 1. Love God 2. Walk in His ways 3. Keep His decrees. God is saying, if you can’t remember My commandments, then make a song or something to remember them by. This is why we sing hymns. But, as we have seen in recent days, some people will refuse to even honor a song of remembrance. The fact that an American citizen, a privileged millionaire, can do this and be hailed heroic by our President and the press doesn’t show tolerance. It shows ignorance. Tolerance would have been shown if we just ignored the person. What we have seen is the lack of unity in this nation, the enemy has infiltrated us, and many Americans are happy about it. We are being destroyed from within. Why? Because we have forgotten God and what we learned after 9/11. Since that fateful day, we have become a nation begging the forgiveness of nations we freed from tyranny and saved from ruin. We are a nation afraid to travel, and inconvenienced every time we do. The enemy can cross our borders, live among us unchecked, and strike when we least expect it. We are a nation afraid of what will happen next. On 9/11, the enemy was a foreign invader who hated us, that was attempting to destroy our way of life and our freedoms. But in many cases today, it’s the very people we have elected to government who are dismantling our freedoms and all that God has given us. Today, our own citizens are in the streets creating chaos and killing those whose job it is to protect us. Islam is gaining ground. You can’t talk about Jesus or read the Bible, but you can talk about Mohammed and force children to read books on the Koran in our national universities and our public schools. The Bible says if anyone comes with any other gospel, let them be accursed - but we’re afraid that’s politically incorrect. To keep from being called names, we remain silent and call ourselves tolerant. Galatians 1:8-10 But even if we or an angel from heaven should preach to you a gospel contrary to the one we preached to you, let him be accursed. As we have said before, so now I say again: If anyone is preaching to you a gospel contrary to the one you received, let him be accursed. For am I now seeking the approval of man, or of God? Or am I trying to please man? If I were still trying to please man, I would not be a servant of Christ. Yes, God is still crying out to us today—to His people, called by His Name. Christians, we have to quit playing “church”. We need to quit letting sin reign in our own mortal bodies. We must be filled with the Holy Spirit. We must stand up for Jesus and live for Him; otherwise, we are no alternative to the decadence around us! We must fight the right enemy, and it is not flesh and blood. 2 Corinthians 10:4 For the weapons of our warfare are not of the flesh but have divine power to destroy strongholds. We must stop attacking each other and love one another; otherwise, we will destroy ourselves. Even if America never repents, as individuals, we are still accountable to God for what we do. Judgment is coming. Jesus told us times like this would come and to get ready, for He would return when people had forgotten about Him. Now is the time to examine our own relationship with the Lord and make right anything that has to be righted. Now is the time to be a light in the darkness so that others can be saved through faith in Jesus Christ. Now is the time to speak up with the Good News of Jesus Christ, while we still can. We must not forget; that is our purpose. That is why we are here—for such a time as this. As believer’s, we must remember that our feeling of security goes beyond the measures of home land defense, beyond metal detectors, security checks, military power, political alliances, or the strength of our economy. Our faith must rest solidly on a relationship with the one and only true and living God, Jesus Christ. Security is not the absence of trouble, but the presence of God, and the confidence and courage He gives in the midst of trouble. Psalm 46:1-2 God is our refuge and strength, an ever-present help in trouble. Therefore we will not fear, though the earth give way and the mountains fall into the heart of the sea. We must not forget the early hours of that fateful Tuesday morning, September 11, 2001. We stared in disbelief as the events unfolded. How could this happen in our country, with our sophisticated intelligence? It was as if we were watching a horror movie as we witnessed airplanes crashing into the World Trade Center, watching the towers topple, listening to a diverted tragedy in Pennsylvania, and seeing our highest military headquarters, the Pentagon, attacked in our nation’s Capital. Air travel was immediately halted and our skies were quiet for the first time since the invention of the airplane. We have been invaded. Our whole society has been infiltrated. We responded by attacking a couple countries, but we soon forgot what happened as we grew tired of the war and verbally attacked each other. So we sought ways to appease our enemy. Now we are hopelessly trying to make ourselves less offensive to them. It is hopeless because we are a nation founded upon Christian values. Christianity will always be offensive to non-Christians. That is what all this is really about! That is why non-Christians, domestic and foreign, are trying to change us—destroy us if necessary—to rid the nation of Jesus Christ or make us forget about Him. We must not forget! We became a new nation because of religious persecution. Look closely at our early settlers and see in whom they put their trust. However, you will have to look in an old history book, for non-Christians are rewriting our history books to hide these facts. Listen to the words of George Washington when he sent a letter to each state’s Governor; "I now make it my earnest prayer, that God would have you and the State over which you preside, in his holy protection, that he would incline the hearts of the Citizens to cultivate a spirit of subordination and obedience to Government—to entertain a brotherly affection and love for one another, for their fellow Citizens of the United States at large, and particularly for their Brethren who have served in the Field, and finally, that he would most graciously be pleased to dispose us all, to do Justice, to love Mercy, and to demean ourselves with that Charity, Humility, and temper of mind which are the Characteristics of the Divine Author of our blessed Religion, and without an humble imitation of His example in these things, we can never hope to be a Happy Nation." Yes, our country made mistakes by treating some Americans as slaves and confining others to reservations. There have been other times when we forgot God and His Word. We suffered the consequences of those mistakes, repented, and worked together as Americans to correct those mistakes. It takes time for a nation to repent. Therefore, we must not forget that God has left us here as His witness. Repentance starts with us (if my people, who are called by My Name...). So, don’t be afraid to stand firm on our Christian principles. It is time for us to embrace them, to declare them, and live according to them. That includes who you vote for. It is important to fill our nation’s capital with Christian people who will respect the differences among our citizenry, yet not compromise our faith in Jesus Christ and uphold our Constitution. Nevertheless, government is not our hope. God is in control and we place our hope in Jesus Christ! We belong in His Kingdom and it is not of this world. If you are wondering how to live in this world, 1 Peter is an excellent letter to read, because it was written to Christians when Nero was the government leader and Christians were being burned alive and fed to lions for his entertainment. God used those Christians to change the world. Live or die, this is our time to be used by God! In the face of persecution, in the face of anything that can potentially be harmful, we have hope through Christ Jesus. He is the Way, the Truth, and the Life, and no one comes to the Father except through Him. Jesus is our savior. He will see us through all that the future has in store. Therefore, we must not forget: Heb. 12:2 Let us fix our eyes on Jesus, the author and perfecter of our faith, who for the joy set before Him endured the cross, scorning its shame, and sat down at the right hand of the throne of God. Jesus is in control and we are victorious in Him. Are you prepared for the future and the Judgment that is coming? You can be if you will believe in Jesus Christ as your Savor, repent of your sin, and follow Him in baptism to be born again of the Holy Spirit. Then you will have His peace, joy, and grace to face the future with hope.